West African fusion group for hire. Zubop Gambia is a collaboration between London-based worldbeat and jazz music group Zubop and the West African master musicians Solomelo (vocals and guitar) and Njega Sohna (vocals, kora, balafon, guitar, djembe) and Njega Sohna (djembe, talking drum, vocals). 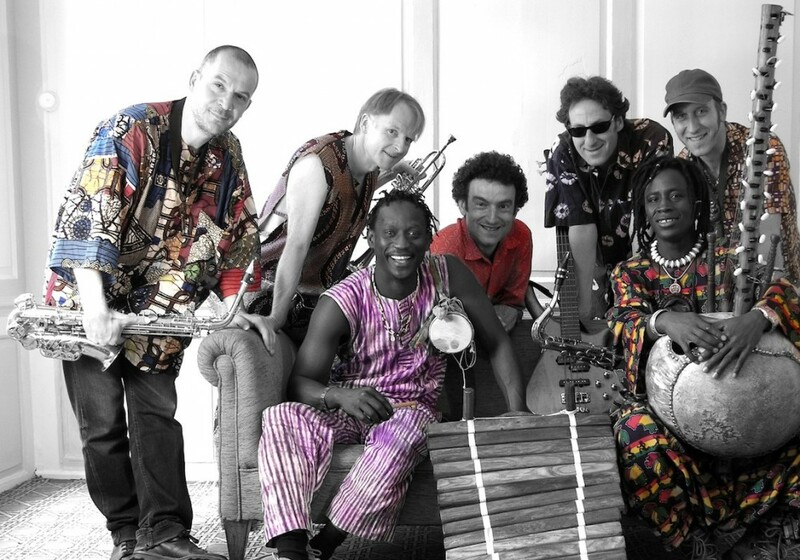 Zubop Gambia is a collaboration between London-based worldbeat and jazz music group Zubop and the West African master musicians Solomelo (vocals and guitar) and Njega Sohna (vocals, kora, balafon, guitar, djembe) and Njega Sohna (djembe, talking drum, vocals). South African born Philip Clouts is the keyboard player and a major composer in Zubop, and extends his heritage with this fusion with West Africa. For the past nineteen years, Zubop have been performing throughout the UK and in continental Europe, playing their unique blend of original music, which is influenced by many musical cultures from around the world. They have released four widely acclaimed CDs and played many major festivals including WOMAD and Glastonbury. In Winter 2003 a number of new collaborative pieces were composed for an Arts Council backed tour of the UK. Some pieces highlight the parallels between us and some the contrasts. ZubopGambia brings together the musical interests and influences of everyone involved – the performances include not only traditional West African pieces, but elements of jazz, township music, pop, reggae, blues and many other styles. The tour included medium and large-scale venues; successes included selling out the 400-seater New Wolsey Theatre in Ipswich, and playing to an audience of 1,000 at Symphony Hall, Birmingham. The final concert at Ronnie Scott’s, London ,where fRoots magazine said ZubopGambia “managed to raise the roof, giving a new focus and energy to Zubop’s jazzy-latin-reggae-afro-blues mix,” was released as a live album in July 04. In Spring 2005 a tour was organised with partners SETA, with additional backing from the Arts Council and PRSF; it played to capacity houses with audiences getting up to dance even in seated venues. The show featured specially commissioned visuals by Evan Manifattori, who has worked with Boy George and Tricky.